Target Center has been a staple of downtown Minneapolis entertainment for nearly three decades. Home to the NBA’s Timberwolves and WNBA’s Lynx, it has also welcomed concerts, skating shows, and entertainment acts for all ages. But as a facility that opened in 1990, it was in need of an update that would keep it competitive with newer facilities across the country. Thanks to a $145 million renovation, it is now ready to entertain 21st century crowds. Target Center has enjoyed its first full year fully renovated and is thriving in downtown’s Warehouse District. 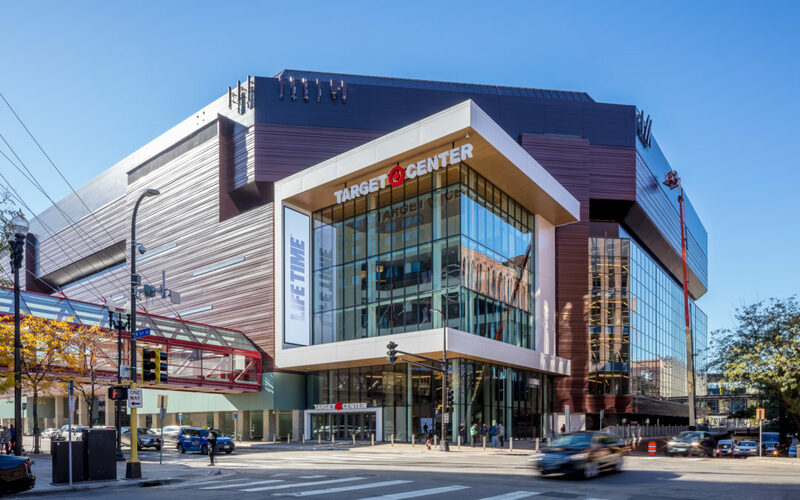 Because of how it is impacting downtown Minneapolis, the Target Center Renovation was selected as one of this year’s 2025 plan leadership award winners. It will be recognized on October 2 at the mpls downtown council annual gala. Target Center now has an updated look that helps complement the Wolves’ and Lynx’s new headquarters facility at Mayo Clinic Square across the street and gives off a vibe that other venues in the city—like Target Field and U.S. Bank Stadium—provide fans when they visit. The renovation added a new lobby filled with franchise and arena history, natural light thanks to large atrium windows, and easier connectivity from street level to the skyways. A brand new Lexus Club was added in the old lobby space, giving a luxury experience to fans sitting in the VIP-style extended floor seating of the arena. The suite level was also renovated, offering a newly enhanced experience. The locker rooms were all updated for home and visiting teams, and inside the arena bowl all new seats and the largest center-hung scoreboard in the upper Midwest was added. Inside the concourse, updated food options were also added. Target Center now has a larger area in the main skyway level for crowds as they enter the arena. A second skyway was added to enter the arena out of Ramp A, and the loading dock area of the arena was expanded to help shows and concerts load in and out. This new Target Center look is already paying dividends for its surrounding area, as people are coming to enjoy games, concerts or shows and taking in the full downtown experience.